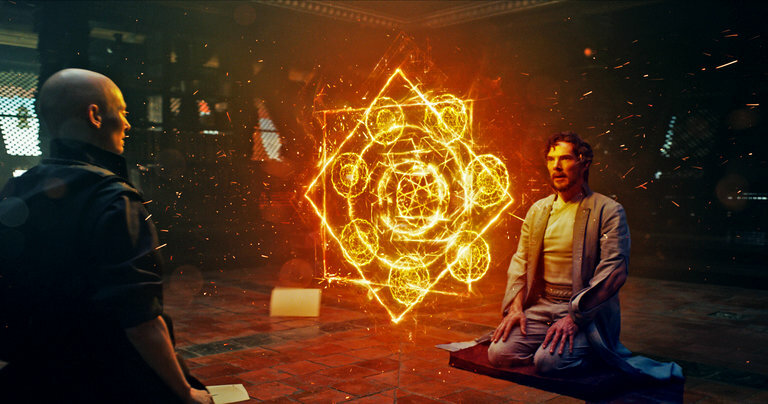 When I last looked at creating some movie magic from Doctor Strange and applying it to miniatures, it was for the floating runes. 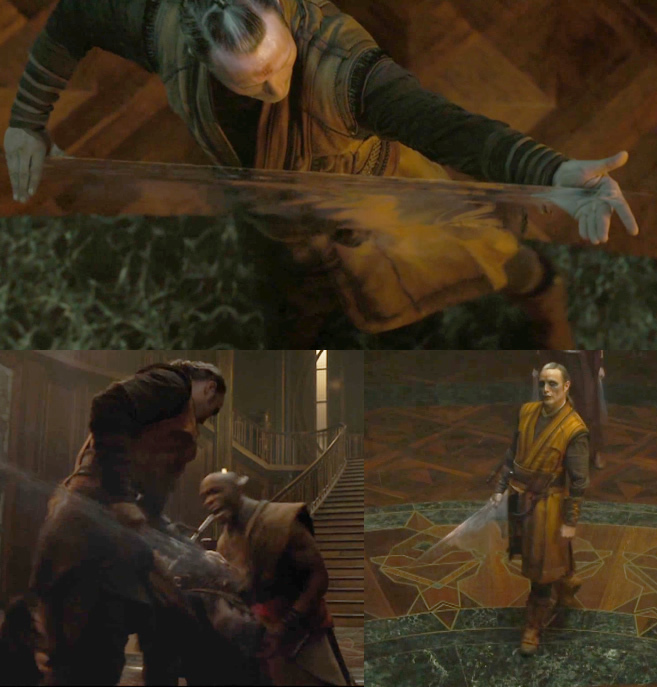 This week I'm going to look at the invisible swords that were created by the antagonists. Now, to be fair, I created the below sword well before Doctor Strange... but since I wrote up THAT tutorial, it made sense to align this tutorial with it. Below is the effect we're going to learn to create today. 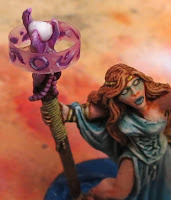 As I've talked about when it comes to recycling, use the plastic packaging your miniature comes in and for a basic sword, cut out the sword shape. 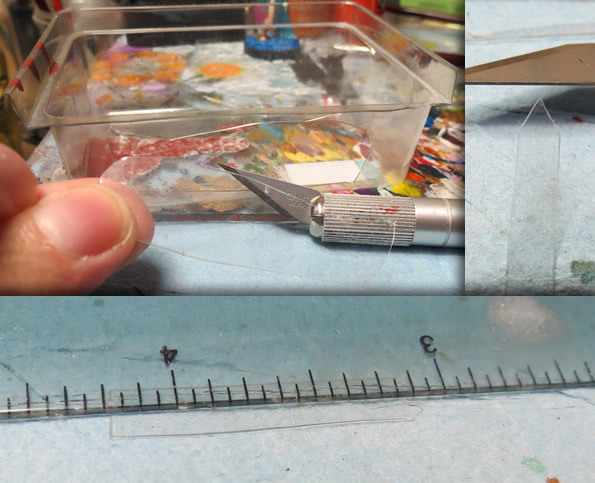 As always, test how it looks on your miniature and make sure scale is right before committing. 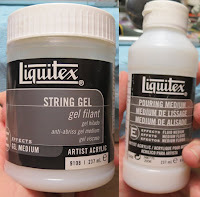 There are a couple products you can use here, I recommend String Gel as it's thicker and will bead better. In other words, it's thick enough that you can place it on the weapon and it's not so liquidy that it'll just flow off. 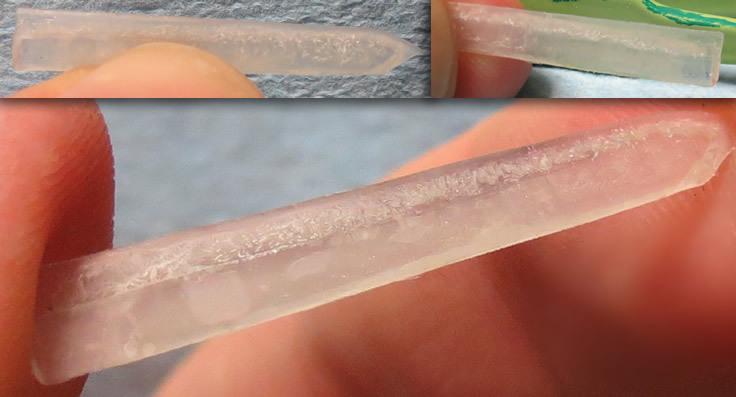 Scoop gel with one of my dentist tools. 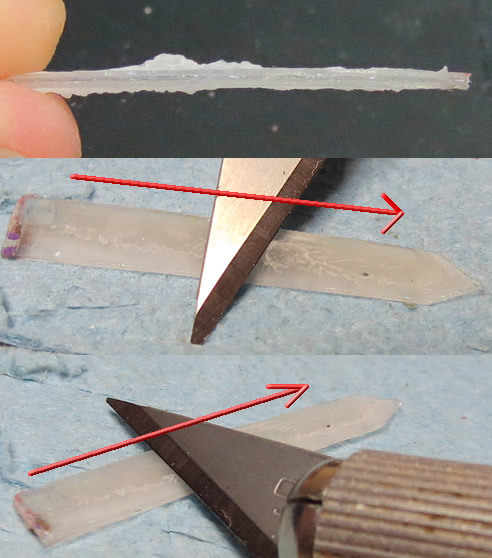 Apply it to the blade and smooth it out evenly. Overall, I prefer the string gel. 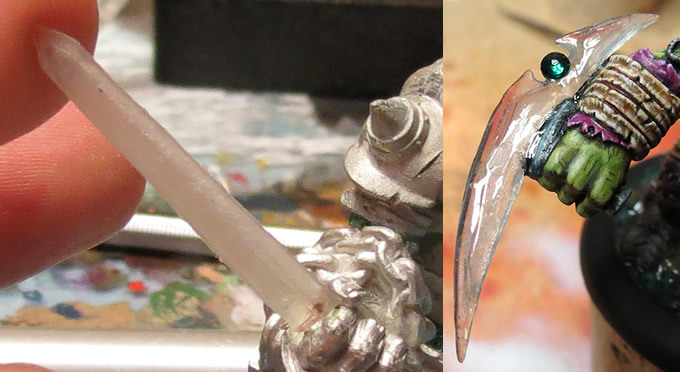 In the example below, I had a slight imperfection along the blade, but I like the extra body it provides. 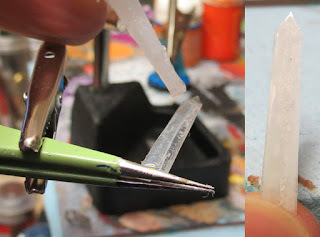 The pouring medium is too thin and if it doesn't dry suuuper level, you end up with one side of the blade too thin and the other side too bulky. 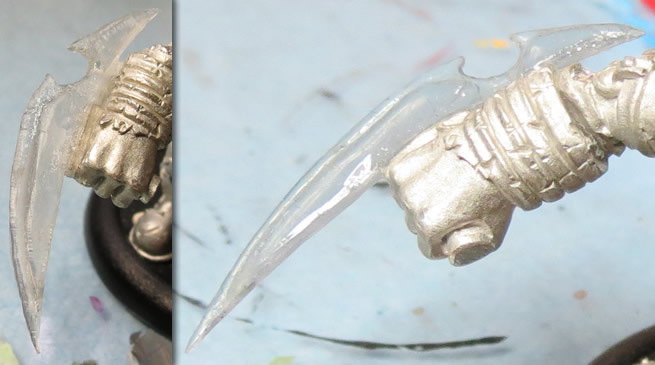 If you want to bulk out, add some depth or add some detail to the weapon, you can layer some other pieces of clear plastic. I even glued a small Swarovski crystal into the crook of the blade and gelled over it too. 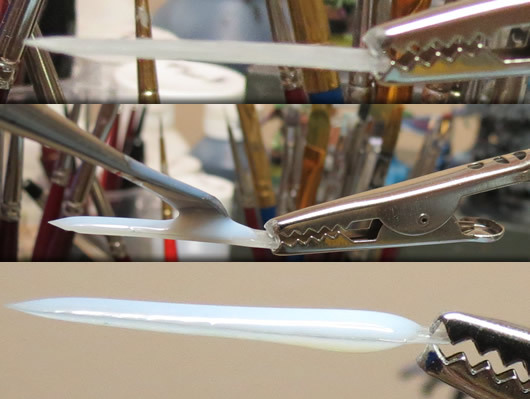 I've then cut two smaller strips, which I superglue above and below the larger main blade to create the form of the sword. You can place these strips wherever you want, just depends on the shape of the sword you want.. in the middle for a thin blade on each side, or as I've done below, against one side to create a larger thin blade. IMPORTANT: The firmer you can clamp these pieces together while gluing them, the clearer the final look of the sword as it's the super glue that frosts over. Since you've basically got a stepped stair look, you'll want to smooth that out. I used super glue for this for a few reasons. 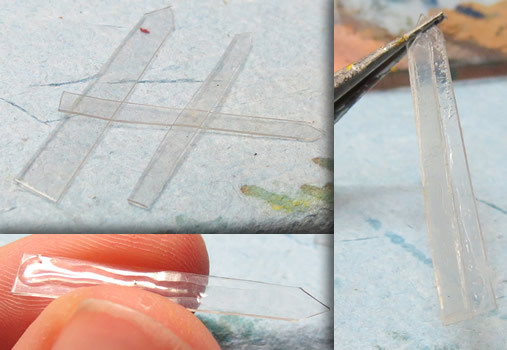 First, it's clear(ish) and easily sandable. The only unfortunate part is how it frosts over. 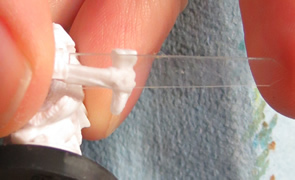 Glue will give you a uniform bulked up look that is slightly translucent. That leaves me with a much smoother weapon with a little form. Don't forget to test it on your model. Still not the clear that we're going for, but I think this time around I used too much super glue, hence the warnings above. Finally, get some wet-sandpaper (1000+ grit) to sand it even smoother / clearer. Remember to cover what you're sanding with water when you're wet-sanding. Looking below, you can see how it ended up. You'll also notice some air bubbles, so I definitely didn't hold the parts together tight enough when I glued them, causing additional frosting. 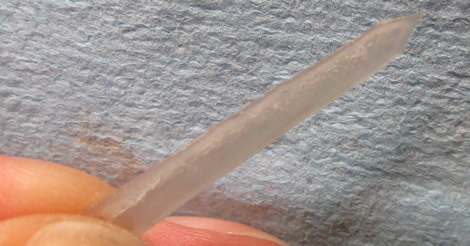 So ultimately, this seems like a slightly difficult process to replicate and how clear it ends up being will be determined by using less super glue and holding the pieces together tighter. From this point, move on to adding gel as covered above. You can see below, how the original blade transitioned.